Misc. : 1 BR, 1.5 BA Beach Property, Sleeps up to 4. This Calypso beachfront condo – this Panama City Beach vacation rental overlooking the sugar-white beaches of the Gulf of Mexico is convenient to shopping, entertainment and dining at the Pier Park mall, located across the street – this Florida gulf coast resort residence is also an easy stroll to Gulf World Marine Park. This Florida vacation rental by owner has exceptional views via floor-to-ceiling sliding-doors in the great-room and in the mast. bedroom…the spacious private balcony is ideal for watching sunsets & sunrises and for entertaining family and friends. 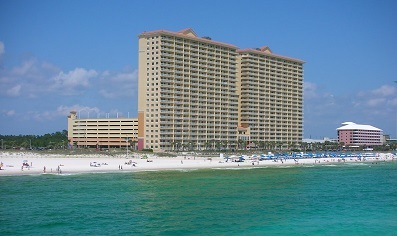 Calypso Resort & Towers in Panama City Beach is located across the street from Pier Park – a variety of shops, restaurants and entertainment are within easy walking distance. Panama City Beach, with a subtropical climate, has an abundance of activities and attractions; popular theme parks include Gulf World Marine Park, offering swimming with dolphin experiences, and Shipwreck Island Water-park, featuring water-slides and pools. St. Andrews State Park is one of 2 protected nature preserves nearby. 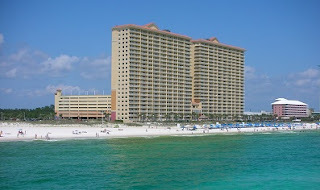 Find you own Panama City Beach Condo and start enjoying coastal living.